Home » 2018 » Hike Kennesaw Mountain! I love living in the South. It is the perfect mix of moderate weather, low cost of living, and great recreational activities. As a resident of Kennesaw, Georgia, I am also lucky to have Kennesaw Mountain Battlefield Park as an extension of my own back yard. 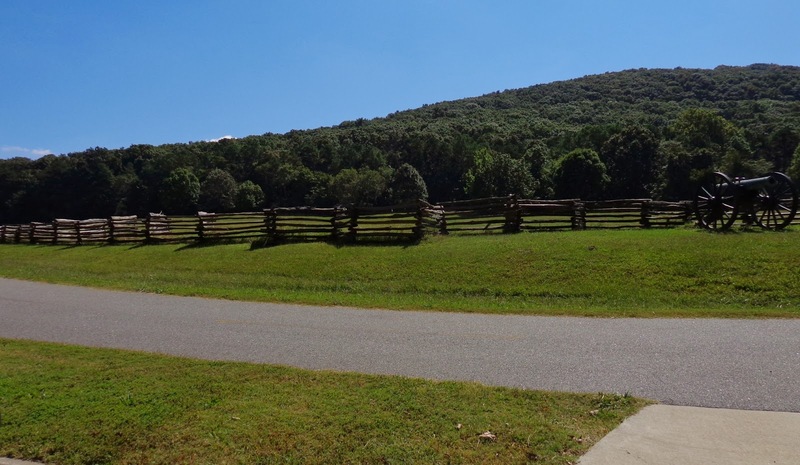 According to the National Park Service, Kennesaw Mountain National Battlefield Park is a 2,965 acre National Battlefield that preserves a Civil War battleground of the Atlanta Campaign. With the park only a few hundred feet from my home, we visit the park and hike the trails almost daily. My oldest daughter has her own walking stick and happily spends hours each weekend walking the 20+ miles of trails, examining rocks, and watching the birds with me. Even at 2.5 years old, I notice that being out in nature has a profound effect on her. I hope to nourish that sense of wonder and love for recreation as we continue to travel to the various National Parks over the next several years. For those that are interested in geology, Kennesaw Mountain is located in the Upper Piedmont geological region, which is most commonly characterized by stratas of igneous and metamorphic igneous rock. This could also explain why these counties with were so rich in gold. Between 1830 and 1959, over 871 thousand ounces of gold were mined in North Georgia. Although Georgia was a historically important gold producer (especially during the Civil War), the state does not presently produce any gold commercially. Gold is still panned from some of its streams. Try your luck! The neighboring city of Acworth was a booming gold-mining town in the mid-1800s. Ruins of gold mines and gold-related industries can still be seen along County Line Rd. in western Cobb County. From a historical perspective, Cobb County was north of the old Cotton Line, which marked the northern limit of cotton species grown before the Civil War. There were few, if any, cotton plantations until the late 1870s when a new variety of cotton was developed which thrived in the river valleys of northwestern Georgia. As a result, relatively few slaves were owned in antebellum Cobb; at least as compared to the thousands in counties within central, west and southern Georgia. Kennesaw once contained numerous mounds, stone cairns and Native American cemeteries. Most were destroyed in the 20th century by private land owners or county utility construction projects. Those that remain are primarily in protected flood plains or on federally owned land in either the Kennesaw Mountain National Battlefield Park or the Chattahoochee River National Recreation Area. Kennesaw Mountain Battlefield Park is one of the most extensive preserved Civil War sites in the South. The park was authorized for protection by the War Department in 1917 and was transferred to the Department of the Interior as a unit of the National Park System in 1933.